Throw on your swim suits, lather up with sunscreen, and get the kids out of the hotel room when you visit Mesa this summer. We’ve rounded up the best pools, splash pads, and water parks that are sure to make a splash with the kiddos and keep the whole family cool. Live out your gnarly surf dreams in the desert on the FlowRider at the Rhodes Aquatic Complex! Kids and adults alike can catch a wave on a boogie board to carve and do tricks. And yes, they give lessons! In addition, Rhodes Aquatic Complex has all the essentials for the perfect sun-soaking day with a beach entry pool, diving boards, lap lanes and a large splash pad with tumble buckets. Mellow out with the family in the lazy river at Mesa’s newest pool, Mesa Aquatic Complex. This perfect water oasis is a child’s dream for summertime fun. The kids will go straight to bed after a day of playing like they’re at the beach in the zero-depth entry pool and inner-tube cruising around the lazy river and vortex pool. Train like you’re one of the best at Skyline Aquatic Center while the kids zoom down the water slide. This aquatic center is stocked with all the water splashing necessities with a beach entry pool, diving boards, water tumble buckets, water slide, and an Olympic-size state-of-the-art competition pool. When we said train like you’re a pro, we meant it. This pool has hosted the best with Olympic gold medalists Michael Phelps and Katie Ledecky competing here in the Arena Pro Swim Series. Riverview Park is known for its amazing playground with a 50 feet tall Genesis climbing tower and a 60 feet long mesh rope climbing structure (see a cool video of it here), but it’s also home to a spectacular splash pad! Enjoy their spray ground, open seven days a week, 10 a.m.- 10 p.m. You can even make an afternoon of it and enjoy lunch at a shaded picnic table after the kids splash around for a bit! Are your kids restless after shopping? Get your errands done at San Tan Village, where you’ll find your favorite stores like Macy’s, Gymboree, Sephora, the Children’s Place, Fossil and Journey’s. After you’re done shopping, take the kids to the popular splash pad and play area where they can blow off steam and you can get off your feet! 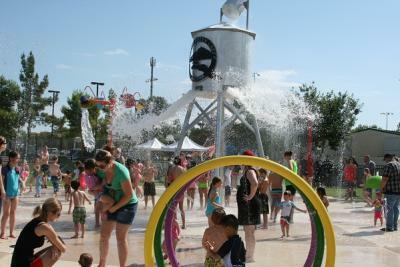 Enjoy a dozen sprays that shoot water into the air at Eastmark’s Splash Pad near Phoenix-Mesa Gateway Airport. Adults can relax in large Adirondack chairs in the shade while the kids have fun in the sun! Founders’ Park in Queen Creek takes splash pads to the next level. Here, kids can play with water cannons, mushrooms and more as they explore the 4,000-square-foot water playground. Open each year from March to October, it’s the perfect way to enjoy the weather, whether it’s Spring Break or summer vacation. Cool off and cut loose with the family at Golfland Sunsplash where kids, and the kids at heart, can enjoy some water leisure. The park is equipped with several breath-taking water slides that will have you dropping and zigzagging around every turn. Not up for the adrenaline rush? Take a plunge in the Thunder Bay wavepool, float along the lazy river, or check out the toddler tadpole pool and other youngster water attractions. Have a ball at this water park any day of the week from 11 a.m.- 7 p.m. and you can even splash around at night until 10 p.m. Wednesday through Saturday. We hope your kids have fun splashing around in City Limitless®. Don’t forget the sunscreen! Capture the memories you make and share them on social media using #MesaCityLimitless!